The last pedestrian Sunday brought about a bout of eating and drinking for me, in particular we ended up getting caught up in the awesome web that is the Trinity Common. Knowing that I needed to try their fried chicken and cornbread waffle I didn’t anticipate a tough decision however when I got there I was overwhelmed with choice. 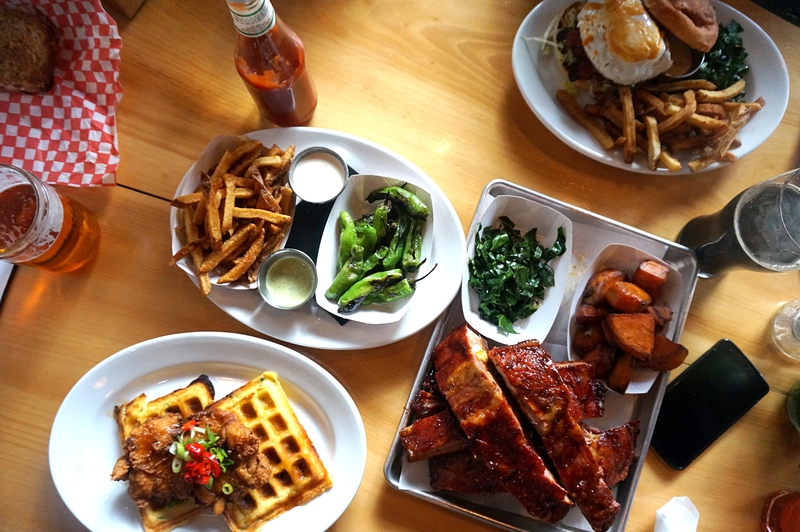 I settled on the chicken and waffles and their BBQ ribs, we also got the choice of sides and we went with their sweet potato, fries, collard greens and shishito peppers. The food all came out together and my first thought was Jesus, those ribs. They were huge, 6 ribs was going to be a challenge. 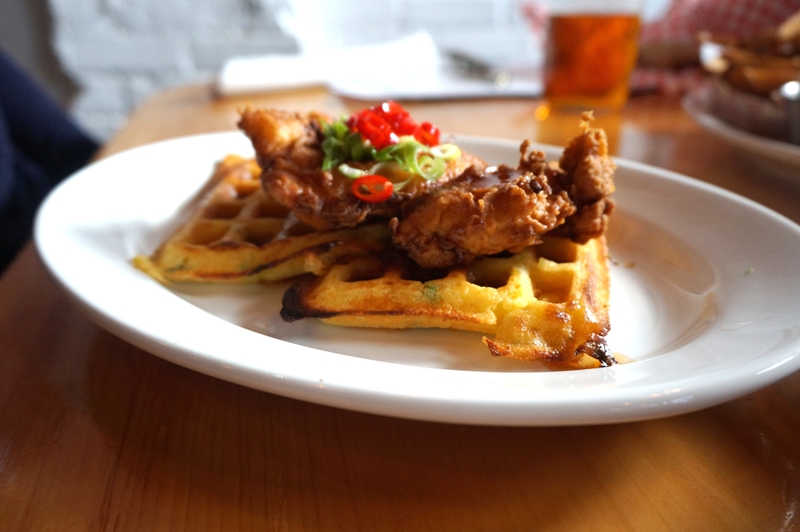 I went for the Chicken first; it was juicy, crispy and flavoured well, the chicken on its own was quality however, I wasn’t s fan of the waffle; the cornbread didn’t have the accenting flavour or texture like a normal waffle does. Not what I’d imagined and somewhat of a letdown. As I mentioned before, the ribs were ludicrously sized. Smoked nicely and sauced liberally in a tangy, pleasing and sticky sauce. I would’ve liked more sauce on the side because I drink the stuff but these were great. Good pork, with a perfect amount of cooking, not super fall off the bone but soft enough to come away when you sink your teeth into them. All the sides were great too, the fries with their malt vinegar mayo being my favourite of them. Trinity Common is doing something great in Kensington, a solid menu of interesting classics with a fantastic environment to boot. 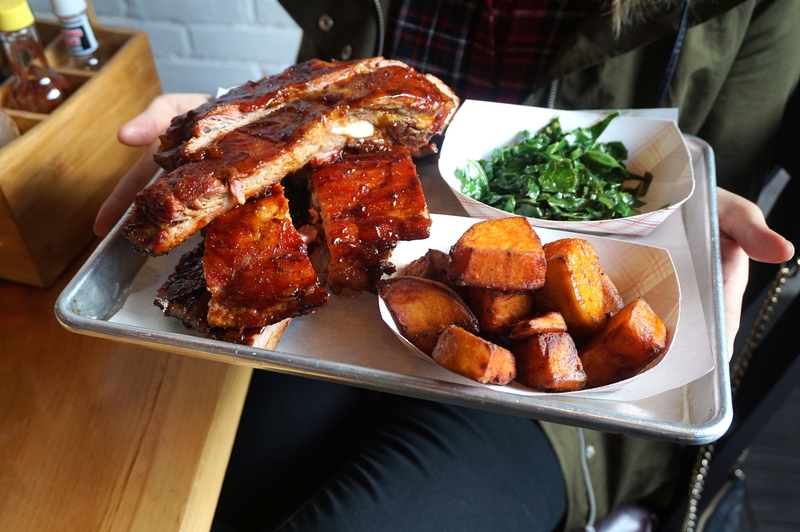 Posted on November 26, 2015 by AdrielPosted in Canada, Fried Chicken, Ribs, SteakLESS, TorontoTagged fried chicken, kensington, Ribs, Toronto, waffles.